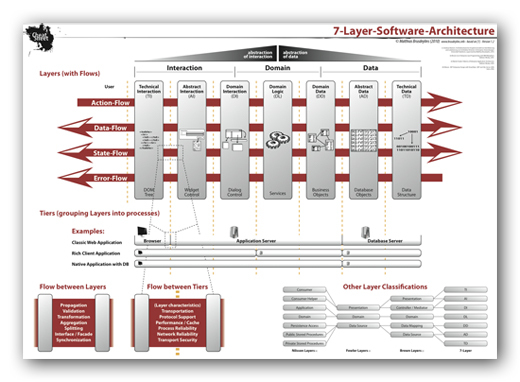 For a soft­ware archi­tect, it is important to take care of the streams bet­ween lay­ers (and so tiers). The­re are four streams: Action (sen­ding, like a button‐click), Data (pre­sen­ta­ti­on and modi­fi­ca­ti­on), Sta­te (pre­sen­ta­ti­on and modi­fi­ca­ti­on) and Error (recei­ving). Bet­ween each lay­er, a soft­ware archi­tect must check, if a vali­da­ti­on, trans­for­ma­ti­on, pro­pa­ga­ti­on and many more is nee­ded. If the­se flows are divi­ded by two tiers, the archi­tect must also take care of net­work trans­por­ta­ti­on, net­work secu­ri­ty and many addi­tio­nal issu­es (for more details see Cheat­S­heet).